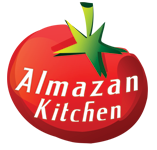 Witness The Mighty Almazan Kitchen’s Special Burger! Available today! Superb coal-roasted Serbian “Vesalica”, glazed in pomegranate tangerine spicy sauce… Served on crispy homemade bread with some fresh organic spinach. Do not hesitate to try it out! We’re revealing our secret recipe special for you! Place 300g of homemade vesalica into the cage and roast for 5 min. Cut in half 2-3 tangerines. Smash 4-5 mini chili peppers. Preheat the pan. Add some oil. Toss smashed mini chili peppers into the pan. Add 1 tbsp. of brown sugar. Remove 300g of homemade vesalica from the grill cage. Slice it onto minor parts. Toss sliced vesalica into the pan with caramelized sauce. Mix, toss & fry for 2-3 minutes. Take the bread. Cut it in half and warm it on fire. Make a layers: bottom slice of bread, handful of spinach, glazed Vesalica. Cover with other half of bread.